You might've been thinking that Godzilla & Co. smashed only generic boxy buildings. Nothing could be further from the truth. 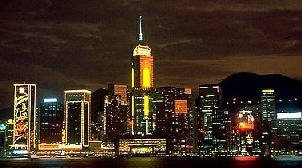 Many times, the structures are recently-built landmarks and may have some significance to the movie beyond monster-fodder. 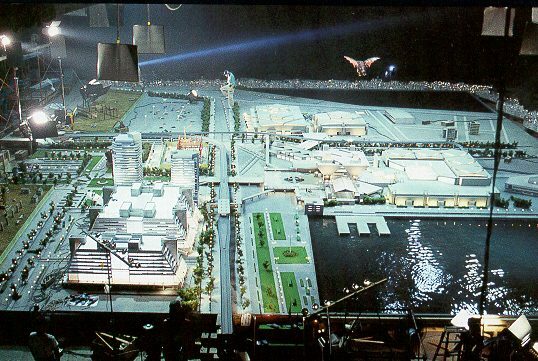 Here are the major locations featured in Godzilla vs Destoroyah, most being intricately designed models. Where possible, all below pictures are of the real-life buildings in Japan (and China). While a miniature streetscape and buildings were used, I did not see any distinctive landmarks. 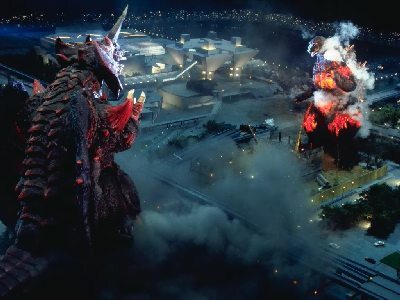 The scenes with Godzilla marching past the city were achieved using optics, where the skyline above was visible. 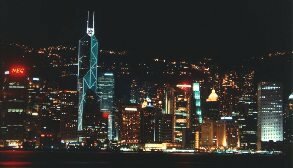 In the above pics, the skyline is accentuated by Central Plaza (gold on left), Hong Kong's tallest at 368m (1207ft), and the Bank of China (blue on right). 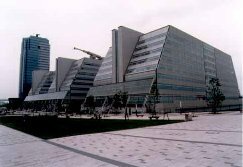 Completed in 1996, this 99m (325ft) building serves as a gateway to the Aomi area. The structure is a satellite communications ground station and has a huge parabolic antenna which is contained in the bridge at the top. The 21st floor has an observation deck with view of Tokyo harbor. This building was also featured in G X Megaguirus. Movie: the Police attacked the Destoroyahs. Tennis anyone? Also called the Ariake Colosseum, this arena serves as Japan's Wimbeldon, but with a retractable roof. Concerts and other sporting events are held here, as was the Super Godzilla Legend Exhibit.The Tennis-no-Mori Park is next door, a complex of outdoor tennis courts. 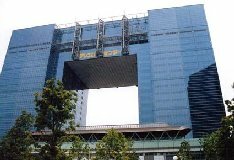 The tower belongs to the Ariake Clean Center, a waste-water treatment plant. Movie: the JSDF took on the Destoroyahs here. This area is a short walk from the JR (Japan Railway) Station and has a stop on the Tokyo monorail. Reclaimed from Shinagawa docks, warehouses, and abandoned lots, it now thrives with hotels, office blocks, shops and restaurants, all connected by a boardwalk. Movie: Junior and Destoroyah battled here. Across one of the canals is the Shinagawa power plant, where Junior blasted Destoroyah. 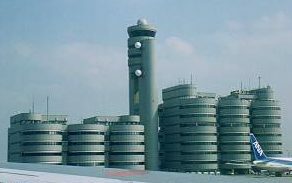 Tokyo's oldest airport, this handles domestic flights and China Airlines flights to Taiwan. 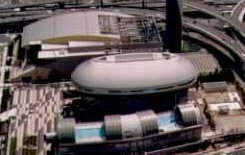 There is a rooftop observation deck with a view of Tokyo Bay and and a 5-story shopping concourse. Unfortunately, the chances of you flying in here are basically nil; most international flights go into Narita, a mammoth airport in the boondocks. Movie: Godzilla and Junior met at the terminal. 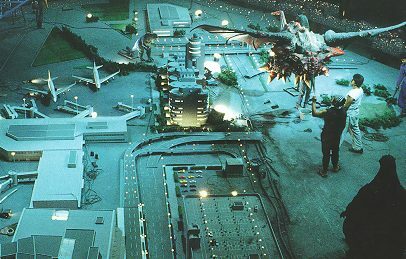 Destoroyah later battled Godzilla on the tarmac. 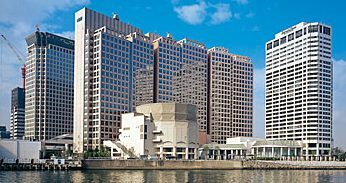 This complex, which includes a 12-story and 21-story Ariake Frontier Bldgs, is the largest shopping center in the waterfront area. The first floor is known as the Wanza Ariake Bay Mall and the Atrium Court contains a 35ft tall Shower Tree fountain, which is illuminated at night. Hmmm, shopping mall... perhaps I can convince Dulce to accompany me on a "GvD Rampage Tour" when we go to Japan! Movie: across from the Big Sight, this didn't last long. 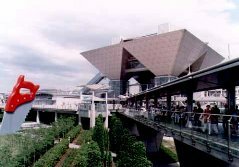 Also known as The Tokyo Big Sight. 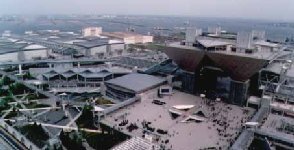 This Ariake convention center erected in 1996 is Tokyo's largest, with over 230,000 square meters (45 football fields) of floor space. The 58m (190ft) tall Congress Tower has the four distinctive inverted pyramids. Claes Oldenburg's 46-foot sculpture Saw, Sawing is out front. Movie: Click the above picture to see! In a brief explosion-simulation scene, Godzilla revisited some of the sites he smashed in the original movie. Want to visit these places? More location pics can be seen in my Art Institute, which has DVD screen captures. Back to movie title page.